Credit: By JacobEnos on Flickr.Some rights reserved. Digital news audiences have risen by 23 per cent in the last year, according to the new World Press Trends report, but publishers are not making the most of their increased audience in terms of revenue. Framing the report in the context of the ongoing attacks against journalists around the world – from imprisonment of Al-Jazeera journalists in Egypt to the assault of reporters at protests in Ukraine, Venezuela and Thailand – Larry Kilman, deputy chief executive of WAN-IFRA, said the press was more relevant than ever before. "In times of political crisis, [why] do those who wish to stifle democracy and free expression immediately summon the newspaper editors, attack journalists, and censor the independent press?" Kilman asked delegates at the 66th World Newspaper Congress in Torino yesterday. "If we were no longer relevant, why would they bother?" The answer, according to the World Press Trends report published today, is that more people are reading the news than ever before. According to the report, 2.5 billion are now people reading newspapers worldwide, while 0.8 billion are now reading news online – a year-on-year increase of 23 per cent in terms of global digital audiences. However, print circulation has continued to decline, by two per cent over five years, while print advertising has declined by 13 per cent over the same period. 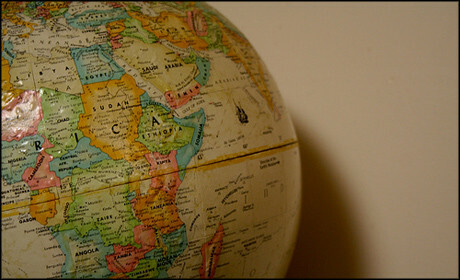 As many publishers will be aware, digital revenue streams are not yet filling that gap. 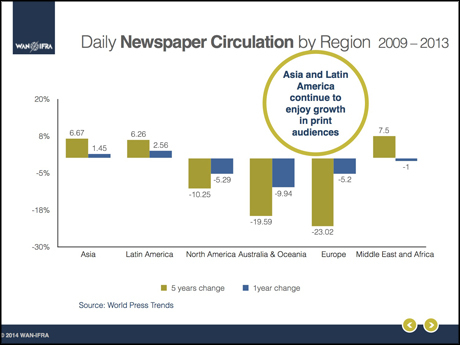 Print circulations are growing in some countries – particularly in "countries with a growing middle class and relatively low broadband penetration," Kilman said – but the regional variations differ wildly. Digital revenues – including income from paywalls and subscription models – are growing though, said Kilman. "Paid digital circulation increased 60 per cent in one year and more than 2,000 per cent over five years, albeit from a very low starting point," he said. "So there is an increasing willingness by the public to pay for newspaper content on digital platforms." Digital advertising is also increasing, Kilman said, up 47 per cent over five years. However, he added that much of internet advertising goes "only to a handful of internet companies, and most of it goes to Google". 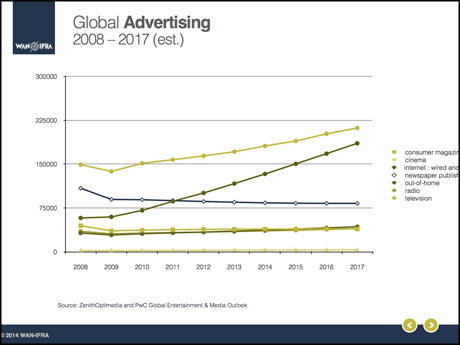 Further, the share of digital advertising revenues to print does not match with the broader trends in growth of advertising. While TV advertising remains the biggest market, online advertising overtook other streams in 2011. "While 46 per cent of the digital population visits newspaper websites, newspapers are a small part of total internet consumption," Kilman said, "representing only six per cent of total visits, less than one per cent of total pages viewed and only around one per cent of total time spent on digital platforms." News organisations have to produce "exciting, engaging offerings for both readers and advertisers", he said, or risk losing their audience and getting disappearing among the "mass of faux news". "Unless we crack the revenue issue, and provide sufficient funds so that newspapers can fulfil their societal role, democracy will inevitably be weakened," he said. 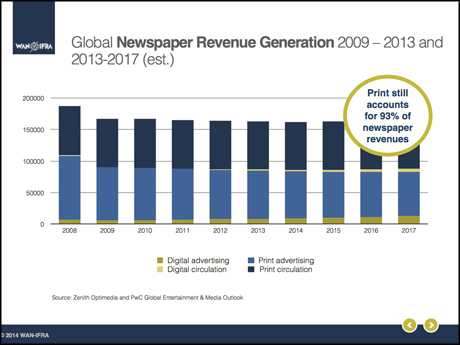 The World Press Trends report is based on information drawn from member associations, representing 18,000 newspapers and 15,000 websites worldwide, or from data partners Comscore, Zenith Optimedia, Ipsos, RAM and PriceWaterhouseCoopers.